This AidCamp was held in conjunction with our partner organisation Strategic Humanitarian Services (SHUMAS) in the rural village of Mogni in the West province of Cameroon. 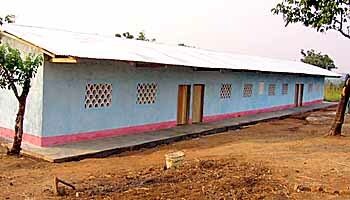 The AidCamp financed and built a proper primary school in the village, the previous school being a small dilapidated building unable to accommodate all the children of the village, many of whom had been sent to live with relatives in other villages in order to get their education. 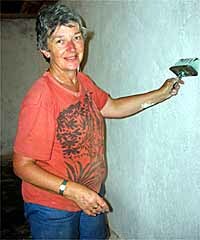 "About a year ago I decided to sign up to the Mogni school project in Cameroon. Two previous trips to Africa on holiday, an imaginative awareness of volunteering and keeping abreast of African news and documentaries (plus of course AidCamps' detailed pre-project information) combined to give me but a hazy impression of what lay ahead. The reality was just like switching from black and white to colour, not only with respect to our stunning surroundings and very basic daily way of life, but above all to the 'human landscape'. I was overwhelmed by the enthusiastic welcome of the villagers and children in Mogni, as they sang and danced on the road to greet our bus, and then swarmed around with hands outstretched to shake ours. This open, easy friendliness and wish to communicate never flagged. Every day as we walked up to the project site, one or more of the children would suddenly appear and take our hand. Whenever they could, the children came to watch us work or set to fetching water or rocks, or pushing heavy barrows of earth with smiles from ear to ear. The chance to be with them in class too was so heart-warming as they fired questions about England and revelled in learning Oranges and Lemons or the Hokey Cokey, even though their own singing and dancing at the welcome and farewell ceremonies outshone our efforts a hundredfold. We just had great fun. It was a real privilege to live amongst such people, to get to know them and witness how they cope with the harsh demands of their lives whilst never losing their innate happiness and optimism. And then there was the immense satisfaction of getting stuck in and learning new skills, of meeting our target of handing over the completed school at our final ceremony, the huge relief that our unknown mix of volunteers turned out to be really quality people who pulled together so well, and the chance to extend our experience of Cameroon beyond the project through fascinating and varied weekend trips, as well as our informative contact with AidCamps' partner NGO, SHUMAS, learning all about their broad-ranging and impressive development work. 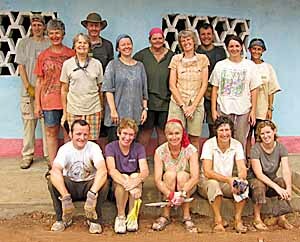 Each individual has a different impetus that drives them to take part in a volunteering project. In my case I wanted to find a way to visit a very different country not as a tourist but with the aims of making a positive contribution, however limited, and of gaining at first hand an insight into the lives and culture of its people. As someone on my own who had never travelled outside the context of a family holiday, I needed to find an organisation that could offer me the opportunity for an effective but reasonably safe challenge. Luckily I knew someone who had participated in three projects already, so AidCamps was the perfect answer and I would unequivocally recommend the experience to anyone who is contemplating such a venture. I have come home with a real sense of achievement but also of enrichment -- and so many happy and positive memories." "We worked, we cried, we laughed. Amazing!" "Enjoyed my first experience of Africa!" "One of the best three weeks I've ever spent. I have travelled a lot but this experience stands out from other holidays. I have really felt part of the community." "This has been a challenge and a unique experience of a traditional culture. I am going home a changed person in several subtle ways." "It was something I'd never dreamt of doing, but now I've done it I'd feel confident of doing something similar"
"A unique opportunity to share an African lifestyle, short though it was." "Fantastic adventure. The AidCamp experience is a great way of providing something wonderful to people that really need help"
"An eye opener to what a meaningful existence you can have with very little material possessions"
"I would definitely recommend AidCamps to anyone looking for a once in a lifetime fabulous experience"
"Truly amazing couldn't wish for a warmer welcome and better neighbours, wish we could've stayed!" "It was great to experience Africa and Cameroon in particular for the first time. The experience was made even better with AidCamps." "We gave the village a school, but we came away with much much more." "Being part of the village, living and working together, made this an unforgettable experience"
"I've learnt more about the African people in 3 weeks than I have done in 50 years"
"We worked, we cried, we laughed. Amazing!" "Enjoyed my first experience of Africa!" "One of the best three weeks I've ever spent. I have travelled a lot but this experience stands out from other holidays. I have really felt part of the community." "This has been a challenge and a unique experience of a traditional culture. I am going home a changed person in several subtle ways." "It was something I'd never dreamt of doing, but now I've done it I'd feel confident of doing something similar" "A unique opportunity to share an African lifestyle, short though it was." "Fantastic adventure. The AidCamp experience is a great way of providing something wonderful to people that really need help" "An eye opener to what a meaningful existence you can have with very little material possessions" "I would definitely recommend AidCamps to anyone looking for a once in a lifetime fabulous experience" "Truly amazing couldn't wish for a warmer welcome and better neighbours, wish we could've stayed!" "It was great to experience Africa and Cameroon in particular for the first time. The experience was made even better with AidCamps." "We gave the village a school, but we came away with much much more." "Being part of the village, living and working together, made this an unforgettable experience" "I've learnt more about the African people in 3 weeks than I have done in 50 years"